The FTSE 100 today sits at 6,520, about 3% down from the start of the year and about 9% below its all-time peak, so what does that mean for future returns? In this post I’m going to investigate this question with the help of a couple of visual aids: a probability “fan chart” and a valuation “heat map”. 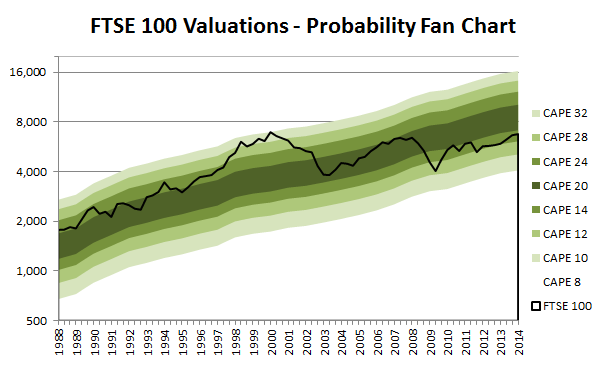 As long-time readers will know, I have an obsession with long-term valuation metrics so I prefer to use CAPE (cyclically adjusted PE ratio, or price to 10-year inflation-adjusted average earnings ratio) to do my FTSE 100 valuations and forecasts. In the long-run the market’s CAPE moves around some central value; sometimes close to it, sometimes far away. But it never strays permanently in one direction or the other. In other words, it reverts back to its mean over time. In the US the median value over the past century is 15.3 and for the FTSE 100, going back over 25 years, it’s 19.3. The UK dataset is too small to be relied upon so I assume that the UK average is 16, which is probably in the right ballpark. 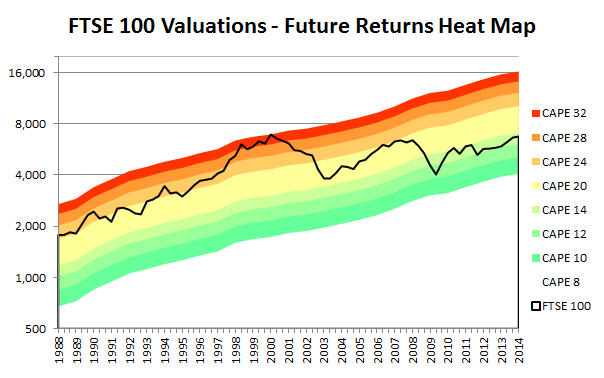 Over the past century the US market has stayed within half and double its long-term average value 89% of the time. In the UK over the past 25 years it’s been more like 100% of the time. So this range of half to double the long-term median CAPE valuation seems like a reasonable range to call “normal”. 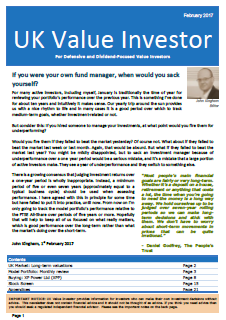 The key insight that comes from realising that the market is mean reverting is that in the medium-term, lower valuations lead to higher future returns than normal and higher valuations lead to lower future returns than normal. This chart shows how the cyclically adjusted earnings of the FTSE 100 have consistently increased over time. The centre dark green band shows where the market would have been if its CAPE were between 14 and 20, i.e. close to its average value. The bands get lighter towards the edge to visualise the idea that the market is more likely to be close to fair value, i.e. 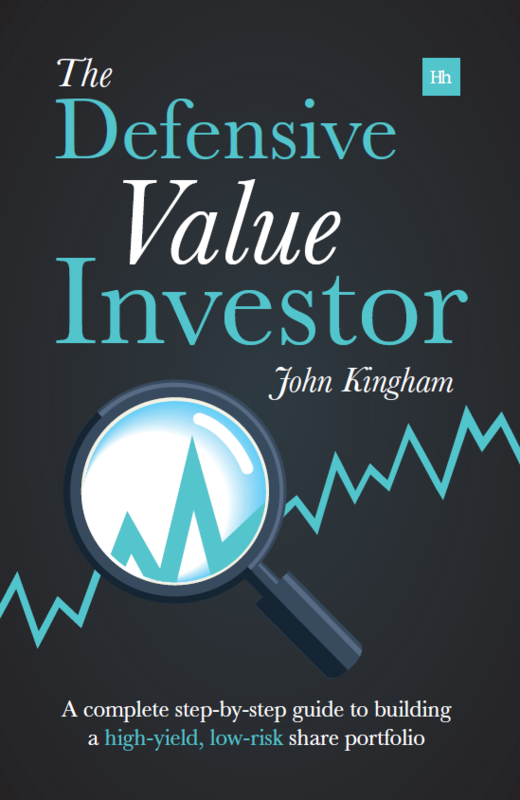 in the centre of its normal valuation range, rather than at extremely high or extremely low valuations. Today, the FTSE 100’s CAPE is about 13. That’s below average, although not by much. This indicates that future returns over the medium-term could be better than their long-run average, which has been around 5% plus inflation, i.e. 7-8% with today’s inflation rates. This is the same set of data with the same valuation bands. Here though the bands show their relative attractiveness rather than the probability of any given valuation being reached. The colour system is based on traffic lights, so red is bad (stop! ), green is good (go! ), and amber is fair value (go when it’s safe to do so!). So while investors partied “like it’s 1999” on the back of the dot-com bubble in 1999, we can now see that those lofty valuations were in fact really bad news for future returns. And that’s exactly what happened, with the market still to break through those previous highs. However, as the underlying companies in the index continue to grow with and beyond inflation, the valuation bands move upwards, and the attractiveness of the market at any given index value gradually gets better over time. So today, although we are close to the all-time highs, the market is in fact relatively attractively priced, as shown by the mild-green band that the FTSE 100 sits in. While a slightly cheap market isn’t particularly exciting, it does imply slightly better future returns than normal. If we have 2% inflation and 2% real growth from the underlying companies, plus 3.5% or so from the dividend and a little bit more if the market mean reverts upwards towards fair value, then over the next 7 years we may get something like a 10% annualised return over that time. At the end of that period in 2021, the FTSE 100 would be at 10,700. Of course there’s a lot of uncertainty in any forecast, both to the upside and downside, but on balance I think the upside currently has the upper hand. There is very little for me to get out from your plots. I knew already the market is rather cheap on historical measures, however that will not say to me too much. It still gets cheaper and stay cheap for many years. I am more interested to price shares of cheap insurance companies, like L&G etc. However I can’t find an edge looking through their old financial statements so I gave up. I am sure that investors don’t have a clue either to price a company like this, all I understood was that a lot of the profit came from the annuities i. e. Bulk annuities deals. I have been lucky I didn’t own any of those financials affected, neither my clients, mainly because of Solvency 2 concerns. So I stayed away and added a bit to two German industrials that should benefit from the recovery. I do like the psychedelic chart. Its only since 2009 that the market has been cheap or reasonable priced so presumably lower secular growth is now priced in. I just wonder if this is the new norm. Perhaps a comparison with earlier periods such as the 70s would help. It covers the period back to 1964 (i.e. 50 years) although it uses the green ‘probability’ chart rather than the traffic light ‘heat map’ approach, but the basic idea is the same. I really like the multi-coloured chart, as it is easier to read. Thanks Ron, glad you like it. Great article. Interested to know the source of your CAPE data for ftse 100.can you share it? http://markets.ft.com/research/Markets/Data-Archive (go to the ‘download data’ section and select ‘equities’ and the ‘FTSE Actuaries’ report, then choose a data. That goes back to 2008 or so, and before that the data comes from less reliable sources; mostly from trawling the web, with some data coming from tables and some from CAPE charts. So it’s not perfect, but that shouldn’t matter as CAPE can’t be used for accurate predictions, and sadly neither can anything else.